2018-05-31 16:00 WEATHER ACTUAL HAVANA CITY. Cloudy and warm with some light rain in places. Maximum temperature 30 Celsius. 2018-05-31 11:00 WEATHER ACTUAL VARADERO BEACH. Cloudy morning with weak winds and calm sea. The maximum temperature is around 28 Celsius. 2018-05-31 08:00 WEATHER ACTUAL HAVANA CITY. Mostly cloudy with occasional light drizzle. High of 25 Celsius. 2018-05-31 03:00 WEATHER FORECAST. NATIONWIDE. It will be mostly cloudy over the western and central regions, sunnier elsewhere in the archipelago. Isolated showers are possible in the afternoon, especially in inland and southern areas. Top temperatures will be in the range of 29-32 Celsius (84-90 F) descending to 22-25 Celsius (72-77 F) overnight. Winds won't exceed the speed of 25 km/h (16 mph). The sea will be calm in most of the archipelago, there will be waves only in the eastern coasts. 2018-05-30 16:00 WEATHER ACTUAL HAVANA CITY. Partly sunny and warm with light southerly winds. High of 30 Celsius but it feels warmer due the high humidity levels. 2018-05-30 09:00 WEATHER ACTUAL MATANZAS CITY. Mostly sunny daybreak with light showers in places. Temperature around 24 Celsius. 2018-05-30 08:00 WEATHER ACTUAL HAVANA CITY. Clouds and rain persist over the whole city. Winds blow light from the south-southeast and the temperature is nice, the thermometer shows 23 Celsius. 2018-05-30 03:00 WEATHER FORECAST. NATIONWIDE. Western region will see the worst of the rain, which maybe heavy and possibly thundery in places. Elsewhere it will be better than days before with a mixture of sunshine and showers. Highs will be in the range of 27-30 Celsius (81-86 F) while the lows overnight will be around 22-25 Celsius (72-77 F). Winds won't exceed the speed of 25 km/h (16 mph). There will be waves on the north-east and across the south coast. In the rest of the archipelago the sea will be mainly calm. 2018-05-29 12:00 WEATHER ACTUAL MATANZAS CITY. Gray and damp with occasional rain over the city. Highs hover around 25 Celsius. 2018-05-29 10:00 WEATHER ACTUAL CIENFUEGOS. Around 9080 people were evacuated so far in the province of Cienfuegos, due to heavy rainfall, flooding and overflowing rivers due the by passing Subtropical Storm Alberto. 2018-05-29 08:00 WEATHER ACTUAL HAVANA CITY. Unsettled and showery with a high of 25 Celsius. Weak SSE winds. 2018-05-29 03:00 WEATHER FORECAST. NATIONWIDE. Following a day of heavy showers for much of the country yesterday, the weather forecast for today is similarly depressing. Rain will persist for much of western and central Cuba, with some locally high rainfall totals. Temperature highs will be in the range of 28-31 Celsius (82-84 F) although they will be lower in the west. Overnight, the mercury will oscillate between 20-23 Celsius (68-73 F) marks. Winds will be generally light all day. 2018-05-28 23:00 WEATHER ACTUAL HAVANA CITY. Cloudy with some spots of rain or drizzle around. Ligth to moderate southern winds and a low of 25 Celsius. 2018-05-28 19:00 WEATHER ACTUAL MATANZAS CITY. Cloudy with spells of intense rain. Temperatures hover around 27 Celsius. 2018-05-28 16:00 WEATHER ACTUAL HAVANA CITY. Partly cloudy and warm with a high of 27 Celsius. Winds come from the south-southeasterly at 15 km/h. 2018-05-28 13:00 WEATHER ACTUAL VILLA CLARA. Torrential rains over most of the province cause rivers to overflow in some areas. 2018-05-28 08:00 WEATHER ACTUAL HAVANA CITY. Cloudy start of the day with light drizzle in places. The thermometer shows 25 Celsius. 2018-05-28 03:00 WEATHER FORECAST. NATIONWIDE. Showers look set to blight many parts of Cuba again today, with the western and central parts seeing the worst of the rain, maybe heavy and possibly thundery in places. Despite clouds and rain, temperatures will stay warm with highs around 29-32 Celsius (84-90 F), although they could be lower in areas of rain. Overnight, the mercury will descend to 22-25 Celsius (72-77 F). There will be rough sea in most of the archipelago, especially on the south-western coast where the waves will be dangerous for aquatic activities. 2018-05-27 20:00 WEATHER ACTUAL HAVANA CITY. Partly cloudy with a high of 26 Celsius. Light winds. 2018-05-27 15:00 WEATHER ACTUAL HAVANA CITY. The rain has calmed down a bit and the sun breaks through the clouds. The wind blows from the south with moderate strength and the thermometer shows 27 Celsius. 2018-05-27 11:00 WEATHER ACTUAL VARADERO BEACH. Cloudy with some sunny breaks and occasional light rain. Temperature not so warm, it feels like 26 Celsius. 2018-05-27 03:00 WEATHER FORECAST. NATIONWIDE. It will be cloudy in most of the country with showers and thunderstorms affecting western and central regions. Daytime temperatures will range from 28-31 Celsius (82-84 F) while the lows overnight will be around 22-25 Celsius (72-77 F). There will be rough sea in the whole archipelago, especially in the south-west where coastal flooding are possible. 2018-05-26 16:00 WEATHER ACTUAL HAVANA CITY. Persistent rain over the whole city with heavy downpours in places. Maximum temperature 23 Celsius. 2018-05-26 13:00 WEATHER ACTUAL MATANZAS CITY. Cloudy with persistent heavy rain over the whole city. Nice temperature, it feels like 24 Celsius. 2018-05-26 11:00 LOCAL TIME - Subtropical Storm Alberto UPDATE. At 1100 AM local time, the center of Subtropical Storm Alberto was located near latitude 21.6 North, longitude 84.9 West, about 220 km SSW of the Cabo de San Antonio, western tip of Cuba. 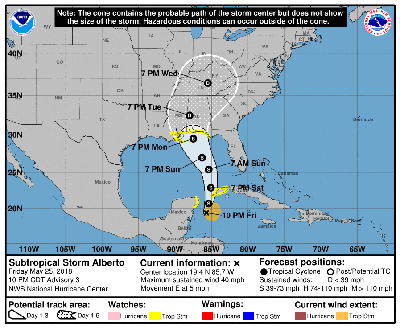 On the forecast track, the center of Alberto is expected to move near the western tip of Cuba this afternoon, where special attention should be given to heavy rains and increased wave height that can cause coastal flooding in lowland areas of south-western coast. 2018-05-26 09:00 WEATHER ACTUAL HAVANA CITY. The rain does not give up on the city being strong in some areas. Mercury marks 24 Celsius. 2018-05-26 03:00 WEATHER FORECAST. NATIONWIDE. Clouds and rain associated with the nearby Subtropical Storm Alberto will dominate today's weather forecast, with showers and thunderstorms that will be more frequent and intense over Pinar del Rio province and the Isla de la Juventud. The temperatures will reach highs between 26-29 Celsius (79-84 F) descending to 22-25 Celsius (72-77 F) at night. Moderately strong winds will produce waves in most of the archipelago with the risk of coastal flooding in lowland areas of the south-west. 2018-05-25 23:00 WEATHER ACTUAL HAVANA CITY. Persistent unstable weather with cloudy skies and occasional showers over most of the city. Not as warm, it feels like 25 Celsius. 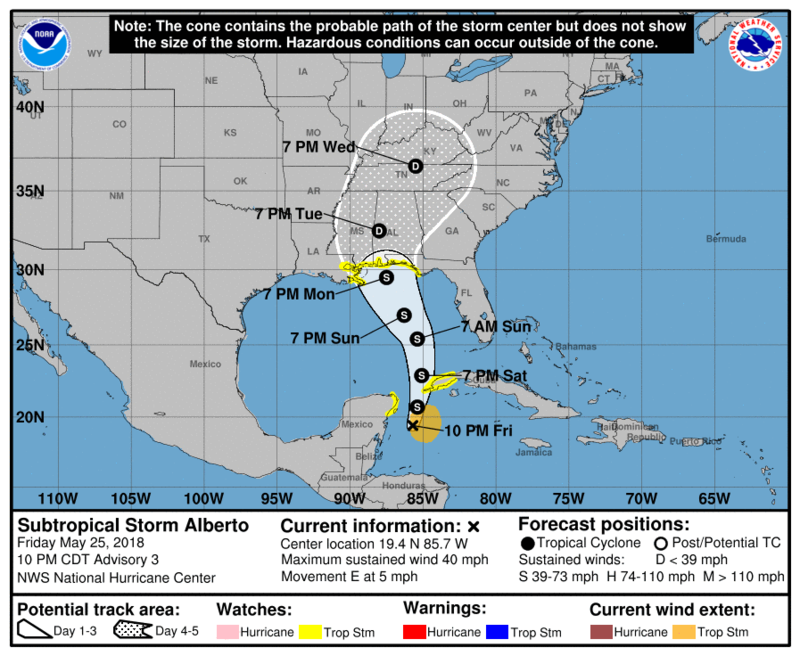 2018-05-25 10:00 LOCAL TIME - Subtropical Storm Alberto UPDATE. 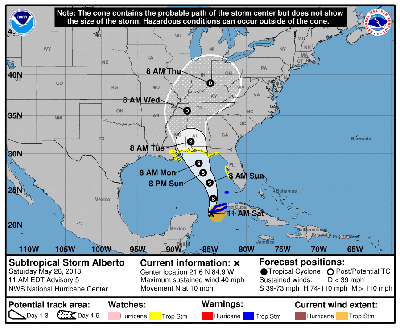 Subtropical Storm Alberto, the first named tropical weather system of the 2018 Atlantic hurricane season will affect western Cuba this weekend. Alberto is expected to bring locally heavy rainfall, mainly in areas of the Pinar del Rio province and the Isla de la Juventud. At 1000 PM CDT (0300 UTC), the center of Subtropical Storm Alberto was located near latitude 19.4 North, longitude 85.7 West, about 290 km SSW of the Cabo de San Antonio, western tip of Cuba. 2018-05-25 17:00 WEATHER ACTUAL HAVANA CITY. Unsettled and warm with a high of 27 Celsius although it feels less warm due the clouds and rain. 2018-05-25 11:00 WEATHER ACTUAL VARADERO BEACH. Cloudy morning with light breeze and calm sea along the beach. High of 27 Celsius. 2018-05-25 08:00 WEATHER ACTUAL HAVANA CITY. Cloudy with occasional light rain or drizzle. Weak east-northeast winds and a high of 26 Celsius. 2018-05-25 03:00 WEATHER FORECAST. NATIONWIDE. Today's weather won't change much from yesterday's; it will cloudy in most of the country with showers and thunderstorms that will be more frequent and intense in the afternoon across western and central provinces. It will remain warm, nevertheless, with highs around 27-30 Celsius (81-86 F) while at night the mercury will shows lows around 22 Celsius (72 F) mark. Winds will be generally light but there will be waves on the south and north-east coast. In the rest of the archipelago the sea will stay calm. 2018-05-24 16:00 WEATHER ACTUAL HAVANA CITY. Damp and cloudy with persistent drizzle over most of the city. High of 26 Celsius. 2018-05-24 13:00 WEATHER ACTUAL MATANZAS CITY. Morning with cloudy skies and not so warm temperature. Light rain at noon. 2018-05-24 07:00 WEATHER ACTUAL HAVANA CITY. A cloudy start over the city with light showers in places. High of 25 Celsius but it feels less warm due to clouds and rain. Winds blow from the east-southeast at a speed of 9-11 km / h.
2018-05-24 03:00 WEATHER FORECAST. NATIONWIDE. It will remain cloudy and damp throughout Cuba with showers and thunderstorms possible over western parts. The rain will extend eastwards in the afternoon, being more significant in the west. Highs will hover around 29-32 Celsius (84-90 F) for most while the lows overnight will be between 21-24 Celsius (57-63 F). Light winds will come from the east-southeast but the rough sea will persist on the eastern and south-western coasts. The rest of the archipelago will enjoy calm sea at the beaches. 2018-05-23 17:00 WEATHER ACTUAL HAVANA CITY. Cloudy with scattered light showers in places. Maximum temperature 27 Celsius. 2018-05-23 11:00 WEATHER ACTUAL MATANZAS CITY. Cloudy morning with temperatures around 27 Celsius. Weak winds and calm sea. 2018-05-23 09:00 WEATHER ACTUAL HAVANA CITY. Cloudy with occasional light rain. Winds come from the east-southeast and the thermometer shows 26 Celsius. 2018-05-23 03:00 WEATHER FORECAST. NATIONWIDE. Bad weather will persist in most of the country with showers and thunderstorms, more frequent and heavier in the west. Maximum temperatures will hover around 26-29 Celsius (79-84 F) descending to 21-24 Celsius (57-63 F) at night. There will be waves on the eastern and south-western coasts while in the rest of the archipielago the sea will be calm. 2018-05-22 16:00 WEATHER ACTUAL HAVANA CITY. Cloudy with occasional showers, heavy in places. Maximum temperature 28 Celsius. 2018-05-22 11:00 WEATHER ACTUAL MATANZAS CITY. Morning with cloudy sky and light rain over some areas of the city. Light winds and temperature of 26 Celsius. 2018-05-22 10:00 WEATHER ACTUAL HAVANA CITY. Partly sunny and warm with light east-southeast winds and a high of 29 Celsius. 2018-05-22 03:00 WEATHER FORECAST. NATIONWIDE. Clouds will be abundant throughout the archipelago, with showers and thunderstorms in the west that will extend in the afternoon to the central provinces. These rains can become strong in some localities, mainly in areas of the north coast. Maximum temperatures will be in the range of 29-32 Celsius (84-90 F) but will descend to 21-24 Celsius (57-63 F) overnight. Easterly winds above 25 km/h (16 mph) will produce waves in the eastern coasts but in the rest of the archipelago the sea will be calm. 2018-05-21 23:00 WEATHER ACTUAL HAVANA CITY. Cloudy with scattered light rain or drizzle. Minimum temperature 26 Celsius. 2018-05-21 16:00 WEATHER ACTUAL HAVANA CITY. Mostly cloudy and warm with some showers in places. Maximum temperature 30 Celsius. Light east-southeast winds. 2018-05-21 11:00 WEATHER ACTUAL MATANZAS CITY. Cloudy morning with a high of 27 Celsius and high humidity levels. Light winds and calm sea. 2018-05-21 09:00 WEATHER ACTUAL HAVANA CITY. Partly cloudy and warm with some isolated light showers. High of 26 Celsius (Feels warmer due to high humidity) and light winds from east-southeast. 2018-05-21 03:00 WEATHER FORECAST. NATIONWIDE. Monday will start cloudy for most, perhaps with some sunshine in the west. With the progress of the day, showers and thunderstorms will occur throughout the country, more frequent and intense in places. Highest temperatures will hover around 28-31 Celsius (82-84 F) while the lows at night will be between 21-24 Celsius (57-63 F). Winds wil be generally light all day long. There will be waves in most of the archipelago. 2018-05-20 22:00 WEATHER ACTUAL HAVANA CITY. Thundery rain over most of the city. Mercury marks 25 Celsius. 2018-05-20 17:00 WEATHER ACTUAL HAVANA CITY. Partly cloudy and warm with increasing chances of rain. Maximum temperature 27 Celsius but feels hotter in the sun. 2018-05-20 11:00 WEATHER ACTUAL HAVANA CITY. Sunny and warm with gentle southeasterly winds and a maximum temperature of 28 Celsius (It feels hotter in the sun). There is calm sea along the coast. 2018-05-20 03:00 WEATHER FORECAST. NATIONWIDE. It will start cloudy across the country although there will be some sunshine in the west. As the day progresses, showers and thunderstorms are expected to fall over most of the island, being more frequent and intense over western and central parts. The temperatures will hover around 28-31 Celsius (82-84 F) throughout the day, descending to 21-24 Celsius (57-63 F) overnight. The winds won't exceed the speed of 25 km/h (16 mph). The sea will be mainly calm in most of the archipelago with waves only in the east. 2018-05-19 17:00 WEATHER ACTUAL HAVANA CITY. Cloudy with heavy downpour and thunder in places. Maximum temperature 27 Celsius. 2018-05-19 11:00 WEATHER ACTUAL HAVANA CITY. Mostly sunny and warm with a high of 28 Celsius (Feels warmer in the sun). Easterly winds at 11 km/h. 2018-05-19 03:00 WEATHER FORECAST. NATIONWIDE. Clouds will predominate in much of the country with occasional showers and thunderstorms in the afternoon. It will remain warm with highs between 28-31 Celsius (82-84 F), somewhat higher in south-east areas; the lows at night will be around 21-24 Celsius (57-63 F). Winds will be light throughout the day. 2018-05-18 15:00 WEATHER ACTUAL HAVANA CITY. Heavy downpours with occasional thunder over much of the city. Maximum temperature 26 Celsius. 2018-05-18 08:00 WEATHER ACTUAL HAVANA CITY. Cloudy start with some light drizzle in places. Thermometer shows 25 Celsius although it feels somewhat cooler. 2018-05-18 03:00 WEATHER FORECAST. NATIONWIDE. A dull, cloudy day is expected today with outbreaks of rain and thunderstorms that will be persistent and heavy in the afternoon across western and central regions. Highest temperatures will range between 28-31 Celsius (82-84 F) while the lows overnight will hover around 21-24 Celsius (57-63 F). Winds will be variable and weak all day. There will be waves on the eastern coasts and mainly calm sea in the rest of the archipelago. 2018-05-17 17:00 WEATHER ACTUAL HAVANA CITY. Partly sunny and warm with a high of 30 Celsius. Weak winds. 2018-05-17 08:00 WEATHER ACTUAL HAVANA CITY. Gray start of the day with occasional light rain in places. Weak winds and a high of 25 Celsius. 2018-05-17 03:00 WEATHER FORECAST. NATIONWIDE. It will be mostly cloudy throughut Cuba with showers and thunderstorms in the west that will become widespread in the afternoon to the rest of the country. Anyway, the warm weather will persist with daytime temperature between 28-31 Celsius (82-84 F) and lows overnight around 20-23 Celsius (68-73 F). Winds won't exceed the speed of 25 km/h (16 mph) and the sea will stay calm for most apart from the eastern coasts where there will be waves. 2018-05-16 23:00 WEATHER ACTUAL. HAVANA CITY. Partly cloudy with light southerly winds. Minimum temperature 25 Celsius. 2018-05-16 17:00 WEATHER ACTUAL. HAVANA CITY. Still cloudy with occasional light showers in places. Maximum temperature 26 Celsius but it feels less warm due light refreshing southern breeze. 2018-05-16 11:00 WEATHER ACTUAL. MATANZAS CITY. Cloudy morning with only some scattered showers and weak winds. Mercury hover around 27 Celsius mark. 2018-05-16 08:00 WEATHER ACTUAL HAVANA CITY. Cloudy with torrential downpours in some places of the city. High of 24 Celsius. 2018-05-16 03:00 WEATHER FORECAST. NATIONWIDE. A cloudy day with occasional showers and thunderstorms is expected today. The rain may be more frequent and torrential in inland areas. The highest temperatures will be around 29-32 Celsius (84-90 F) while the lows at night will be between 20-23 Celsius (68-73 F). There will be waves in the eastern coasts and mainly calm sea in the rest of the archipelago. 2018-05-15 23:00 WEATHER ACTUAL. HAVANA CITY. Mostrly clear and warm with a high of 27 Celsius. Weak winds. 2018-05-15 16:00 WEATHER ACTUAL. HAVANA CITY. Mostly cloudy with occasional light showers and moderate southerly winds. Not as warm, the mercury marks 26 Celsius. 2018-05-15 11:00 WEATHER ACTUAL. MATANZAS CITY. Overcast skies with light rain over some areas of the city. High of 27 Celsius. 2018-05-15 09:00 WEATHER ACTUAL. HAVANA CITY. Cloudy with light rain or drizzle in places, mainly over northern areas. Maximum temperature 25 Celsius. 2018-05-15 03:00 WEATHER FORECAST. NATIONWIDE. It will stays cloudy for most with the risk of some showers. The worst of the showers are most likely over north western areas with some torrential downpours in places. Despite clouds and rain, mercury will reach highs around 28-31 Celsius (82-84 F), somewhat higher in the south-east. Overnight, temperatures will be between 20-23 Celsius (68-73 F). Winds won't exceed the speed of 25 km/h (16 mph). There will be some waves in the north-east and calm sea in the rest of the coasts. 2018-05-14 22:00 WEATHER ACTUAL. HAVANA CITY. Partly cloudy and nice with a low of 25 Celsius. 2018-05-14 15:00 WEATHER ACTUAL. HAVANA CITY. Cloudy with downpours and thunder in places. Maximum temperature 27 Celsius. 2018-05-14 15:00 WEATHER ACTUAL. VARADERO BEACH. Mix of clouds, sun and very hot due to high humidity (Feels like 32 Celsius). Light winds and minor waves on the beach. 2018-05-14 07:00 WEATHER ACTUAL. HAVANA CITY. The day has begun with a mix of sun and clouds, with mercury marking 25 Celsius and light winds from the south. Some light and isolated to showers in inland areas. 2018-05-14 03:00 WEATHER FORECAST. NATIONWIDE. It will be a mostly cloudy day with occasional showers in the north-west that will extend to the east later. However some clearer intervals are possible, mainly in the west. Temperatures will remain warm throughout the day with highs ranging around 28-31 Celsius (82-84 F) and lows overnight between 22-25 Celsius (72-77 F). Winds will be generally light all dat through and the sea will stay calm in most of the archipelago. 2018-05-13 17:00 WEATHER ACTUAL. HAVANA CITY. Cloudy and warm with occasional rain showers. The thermometer shows 26 Celsius but feels warmer due to weak winds and high humidity. 2018-05-13 11:00 WEATHER ACTUAL. MATANZAS CITY. Cloudy morning with occasional rain all over the city. Temperature around 28 Celsius. 2018-05-13 03:00 WEATHER FORECAST. NATIONWIDE. Clouds will predominate throughout most of Cuba with showers and thunderstorms that could be frequent and intense in places. Highs will hover around 27-30 Celsius (81-86 F), while the lows overnight will be near 23-26 Celsius (66-72 F). 2018-05-11 19:00 WEATHER ACTUAL. HAVANA CITY. Cloudy with occasional spot of rain or drizzle. Max temp 26 Celsius. 2018-05-11 15:00 WEATHER ACTUAL. HAVANA CITY. Persistent light rain over most of the city. Maximum temperature 27 Celsius (Feels warmer despite the rain). 2018-05-11 11:00 WEATHER ACTUAL. BOCA DE CAMARIOCA, MATANZAS. Morning with overcast skies and occasional light rain. The mercury in the thermometer round the mark of 28 Celsius. 2018-05-11 07:00 WEATHER ACTUAL. HAVANA CITY. Cloudy start of the day with occasional light drizzle in places. The thermometer shows 25 Celsius. 2018-05-11 03:00 WEATHER FORECAST. NATIONWIDE. It will remain cloudy in most of the country, with showers and thunderstorms which will be more frequent and intense in the afternoon in the western region. Daytime temperatures will stay around 30 Celsius (81-86 F) while the lows overnight will be near 23-26 Celsius (66-72 F). Light winds are expected throughout the day and consequently we can expect quiet sea in most of the archipelago. 2018-05-10 20:00 WEATHER ACTUAL. HAVANA CITY. Persistent light rain over most of the city. Mercury marks 24 Celsius. 2018-05-10 16:00 WEATHER ACTUAL. HAVANA CITY. Persistent light rain over the city, heavier in places. Maximum temperature 25 Celsius. 2018-05-10 11:00 WEATHER ACTUAL. VARADERO BEACH. Cloudy morning with occasional showers. High of 28 Celsius. 2018-05-10 09:00 WEATHER ACTUAL. HAVANA CITY. Cloudy and warm, with weak southwest winds and a high of 28 Celsius. 2018-05-10 03:00 WEATHER FORECAST. NATIONWIDE. Another rather cloudy day with the best of any sunny spells in the west. Some showers can be expected in the afternoon, these mainly across central parts where they will more frequent and heavy. Maximum temperature throughout the day will be around 29-32 Celsius (84-90 F), falling to 20-23 Celsius (68-73 F) in the evening. Calm sea is expected althought the waves will continue pounding the southern strip between Punta de Maisi and Cabo Cruz. Weak and variable winds. 2018-05-09 23:00 WEATHER ACTUAL. HAVANA CITY. Warm evening under partly cloudy skies, the thermometer shows 27 Celsius. 2018-05-09 07:00 WEATHER ACTUAL. HAVANA CITY. Partly cloudy start of the day with light drizzle in places. The mercury marks 27 Celsius. 2018-05-09 03:00 WEATHER FORECAST. NATIONWIDE. Largely cloudy throughout the country, with occasional showers, these locally heavy and more frequent in the afternoon across central provinces. Temperature will be in the range of 29-32 Celsius (84-90 F) while the lows overnight will be near 20-23 Celsius (68-73 F). Winds won't exceed the speed of 20 kmph (12 mph) and the sea will remain calm in most of the archipelago. 2018-05-08 18:00 WEATHER ACTUAL. MATANZAS CITY. Mostly sunny afternoon with high temperature (28 Celsius) and weak winds. 2018-05-08 16:00 WEATHER ACTUAL. HAVANA CITY. Mostly sunny and warm with a high of 29 Celsius although it feels hotter in the sun. Mild winds. 2018-05-08 09:00 WEATHER ACTUAL. HAVANA CITY. A mix of sun and clouds with a high of 28 Celsius (Feels warmer in the sun). Light winds. 2018-05-08 03:00 WEATHER FORECAST. NATIONWIDE. Cloudy in the east, with showers nd thunderstorms that will be more frequent in the afternoon. A mostly sunny day further west although with some showers possible later. Maximum temperature will remain in the range of 29-32 Celsius (84-90 F) while the lows overnight will be around 23-26 Celsius (66-72 F). Winds will be variable and weak and the sea will stay calm in most of the archipelago with some waves only in the south-east coast. 2018-05-07 17:00 WEATHER ACTUAL. HAVANA CITY. Partly sunny and warm with a high of 29 Celsius. Light northerly winds. 2018-05-07 11:00 WEATHER ACTUAL. VARADERO BEACH. Morning with some clouds and sun. Temperature of 28 Celsius and gentle winds. 2018-05-07 09:00 WEATHER ACTUAL. HAVANA CITY. Partly sunny and warm with a high around 28 Celsius. Weak winds from the north. 2018-05-07 03:00 WEATHER FORECAST. NATIONWIDE. Institute of Meteorology’s Forecast Center is forecasting cloudy skies across central and eastern regions with the risk of showers and thunderstorms. It will be mostly sunny and dry elsewhere although the odd showers cannot be completely ruled out in the afternoon. Highs will stay in the range of 29-32 Celsius (84-90 F) while the lows tonight will be around 23-26 Celsius (66-72 F). Winds will be generally light and sea will be calm in most of the archipelago. 2018-05-06 17:00 WEATHER ACTUAL. HAVANA CITY. Mostly sunny but with the odd sharp showers in places. Maximum temperature 29 Celsius. 2018-05-06 11:00 WEATHER ACTUAL. MATANZAS CITY. Mostly sunny morning with high temperature, it feels like 32 Celsius. 2018-05-06 11:00 WEATHER ACTUAL. HAVANA CITY. Mostly sunny and warm with a high of 29 Celsius (feels warmer in the sun). Wind blows from the south-southwest at a speed of 9 km / h.
2018-05-06 03:00 WEATHER FORECAST. NATIONWIDE. Cuba will wake up to a sunny day in most of the archipelago apart from the easternmost area where it will be cloudy with some outbreaks of rain. As the day progresses, the clouds and chances of precipitation will increase across the country, bringing showers and thunderstorms that will be more frequent over the central region. High temperatures will be around 29-32 Celsius (84-90 F) while the lows overnight will be in the range of 21-24 Celsius (57-63 F). Winds will be generally light but the rough sea will persist in the eastern coasts. The rest of the archipelago will enjoy calm sea at the beaches. 2018-05-05 19:00 WEATHER ACTUAL. MATANZAS CITY. Mostly cloudy with occasional light rain. Temperature not so warm, it feels like 26 Celsius. 2018-05-05 17:00 WEATHER ACTUAL. HAVANA CITY. Partly cloudy with occasional light showers in places. Maximum temperature 26 Celsius. 2018-05-05 13:00 WEATHER ACTUAL. HAVANA CITY. Mostly cloudy with light northerly winds. Mercury marks 28 Celsius but it feels hotter due the high humidity. Rough sea along the city seafront. 2018-05-05 03:00 WEATHER FORECAST. NATIONWIDE. After a fine start, clouds will steadily increase throughout the country bringing some showers and thunderstorms, heavy in places. Maximum temperature will be in the range of 27-30 Celsius (81-86 F), somewhat warmer on eastern areas; overnight, the lows will be around 21-24 Celsius (57-63 F). There will be waves along the north and south-east coasts whereas the rest of the south coast will enjoy calm sea at the beaches. 2018-05-04 23:00 WEATHER ACTUAL. HAVANA CITY. Mostly clear and warm with light to moderate winds. Minimum temperature 26 Celsius. 2018-05-04 11:00 WEATHER ACTUAL. MATANZAS CITY. Sunny morning with high temperature and moderate breeze that causes waves throughout the city's coastline. 2018-05-04 07:00 WEATHER ACTUAL. HAVANA CITY. 2018-05-04 03:00 WEATHER FORECAST. NATIONWIDE. It will be a warm and mostly sunny day although showers and thunderstorms are expected in the area to the east of Camaguey province during the afternoon. Temperatures will remain high with maximums around 29-32 Celsius (84-90 F) and lows overnight near 24 Celsius (63 F). Northeasterly winds will blow with speeds between 15-30 km/h (9-19 mph) but may be stronger in areas of the north western coast. There will be waves throughout the north coast and calm sea in the south. 2018-05-03 16:00 WEATHER ACTUAL. VARADERO BEACH. Mostly sunny afternoon with high temperature and light winds. Waves along the beach. 2018-05-03 09:00 WEATHER ACTUAL. HAVANA CITY. Sun and clouds over the city with mild easterly winds and a maximum of 28 Celsius. 2018-05-03 03:00 WEATHER FORECAST. NATIONWIDE. It will be sunny in much of the archipelago but will cloud over in the afternoon to the east of Camagüey province with showers and thunderstorms that will be heavy in some places. The temperatures will reach highs between 29-32 Celsius (84-90 F) throughout the day, while the lows at night will be between 21-24 Celsius (57-63 F). Winds will come from the north-east at speeds between 15-30 km/h (9-19 mph), although they may be stronger in areas of the north coast. There will be waves across the north coast and calm sea in the south. 2018-05-02 23:00 WEATHER ACTUAL. HAVANA CITY. 2018-05-02 17:00 WEATHER ACTUAL. HAVANA CITY. Largely sunny and warm with a high of 29 Celsius. Light north-east winds. 2018-05-02 11:00 WEATHER ACTUAL. VARADERO BEACH. Sun and clouds over the peninsula with light waves along the beach. Warm, mercury shows 28 Celsius but it feels warmer in the sun. 2018-05-02 08:00 WEATHER ACTUAL. HAVANA CITY. Mostly sunny and warm with a high of 28 Celsius (Feels warmer in the sun). Light east-northeast winds. 2018-05-02 03:00 WEATHER FORECAST. NATIONWIDE. It will be hot and mostly sunny throughout the day although with a chance of some thundery downpours in inland areas during the afternoon. Highs will hover around 29-32 Celsius (84-90 F) while the lows overnight will be in the range of 23-26 Celsius (66-72 F). North-east winds, sometimes above 30 km/h (19 mph) will cause waves along the north coast but in the south the sea will remain calm. 2018-05-01 17:00 WEATHER ACTUAL. HAVANA CITY. Warm and sunny with light north-east winds. Maximum temperature 29 Celsius. 2018-05-01 13:00 WEATHER ACTUAL. MATANZAS CITY. Mostly sunny and warm with mild east-northeast winds. High of 30 Celsius. 2018-05-01 07:00 WEATHER ACTUAL. HAVANA CITY. Nice start of the day with mostly clear skies and light winds. The mercury marks 25 Celsius. 2018-05-01 03:00 WEATHER FORECAST. NATIONWIDE. Today's weather won't change too much from yesterday's; much of the country again will be sunny and warm apart from the north-central area where a slightly overcast sky is possible. Some outbreaks of afternoon rain and thunderstorms are likely across southern parts of the island but the rest of the country will remain dry. The highs will remain steady around 28-31 Celsius (82-84 F) with generally light winds. Later on, overnight, the temperature will drop to values in the range of 22-25 Celsius (72-77 F). Rough sea is expected along the north coast while in the South the sea will stay calm.